ipConv is a universal protocol conversion solution for coupling a wide range of different protocols. Its architecture (ipConv Architecture) ensures maximum independence between the different protocols used. As protocols are kept completely separate with respect to data transmission methods and information representation, the solution greatly facilitates system planning and commissioning. For instance, the different protocols can be tested separately. These ipConv Use Cases show the wide range of applications for ipConv. ipConv provides the foundation for specialized products such as ipConvLite and ipConvOPC. Even ipRoute is based on ipConv. The universal solution ipConv has been designed for cases where special project-specific requirements exceed the capabilities of these specialized products. 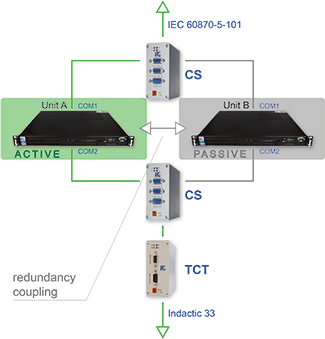 For centralized use ipConv is available with the most powerful hardware platforms IPC191V4 19" 1U and IPC191I7 19" 1U, which can be equipped with further interfaces via PCIe expansion slots. For customers who already have the necessary hardware, we offer the Windows software package ipConvOPC for universal protocol conversion. To meet even increased security requirements, ipConv is fully capable of redundancy in combination with a second device.